Does your dog come running to you whenever you’re eating something and just want a piece of it? As a loving dog owner that you’re, you may just throw a piece of it to satiate your four-legged friend. But what about forbidden dog foods? Can dogs eat pickles? Is it safe for them? Feeding your pet pooch can sometimes cause a trouble. As their bodies work differently than us, not all foods suitable for humans are good for dogs as well. In this post, I’ll share the most common question asked on many forums whenever the dog finds his way around the food and gobbles down on pickles. Can My Dog Eat Pickles? The answer to that is- Yes. Surprisingly, an occasional bite of pickle won’t harm your dog. However, you must not include it as a staple in his diet. Pickles are made from brine or vinegar (or other acidic solutions), salt and other added spices. What goes into the pickle determines if the pickle is ok for your dog or not. If your dog is too keen on trying one, just give him a bite or two of the pickle but remember not to overdo it. Though, there are a few considerations that make pickle a forbidden food for your canine friend. Should Your Dog Eat Pickles? No. Pickles are not the healthiest of choices for your dog. As discussed above, pickles are made from vinegar and other acidic solutions combined with salt and seasonings. These ingredients can cause your dog to have minuscule problems or worse, ailments like anemia and heart conditions. Let me break down the most common ingredients that should definitely not be a part of the pickle you treat your pet with. Most homemade bread and butter pickle recipes are made using onions. Onions are not good for your dog’s health. This harmful vegetable contains a high-level of thiosulphate. 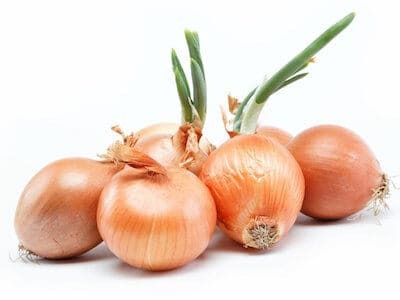 Onions may trigger Haemolytic anemia in your dog. Haemolytic anemia is more commonly referred to as Heinz Body Anemia. This ailment causes a formation of Heinz bodies in your dog. Essentially, the red blood cells in Heinz area become brittle and rupture. Most common symptom of this health issue is that the urine will become dark colored. Induced by onions and other allium family vegetables like garlic, anemia causes loss of appetite and fatigue. This health concern rarely becomes fatal. It can be treated by keeping your dog off onions and instead of getting him on a healthy diet schedule. 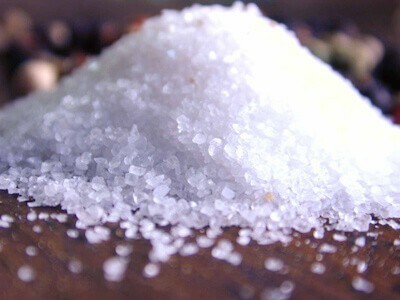 In like manner, Sodium in large amount should not be consumed by your dog. Unfortunately, a medium sized pickle contains somewhere between 700 to 1500 mg sodium. The recommended amount for your dog is around 100 mg per day. As noted above, I am sure you have a brief idea of how bad a pickle can be for your beloved pet. Moreover, most dog foods have already added the sodium amounting to the daily requirement of the dog. So, your pet doesn’t really need the additional sodium present in the pickles. Are you now worried that your dog had that pickle? Hold up a minute and don’t call your vet yet. A little amount of pickle in moderation is not going to harm your dog. However, it is an alien food for their digestive system and if your dog has a sensitive gut, he may be prone to an upset stomach or diarrhea. Likewise, excessive sodium can trigger high blood pressure in hypertensive dogs. In the long run, it may lead to an early age stroke and even fatal heart attack. This is by far a really painful condition for the canine bodies. Dogs who consume regular high-sodium foods like pickles may become a victim of Pancreatitis. In this condition, your dog’s pancreas stops working properly. Hence, the breakdown of fats and sodium is not possible. Consequently, the stomach gets very sore and the dog has a problem moving around. For treatment, he may be hospitalized and given IV fluids. But you’ll have to keep him on a low-sodium diet for quite a while to avoid recurrence of this disease. And what about pickle juice? 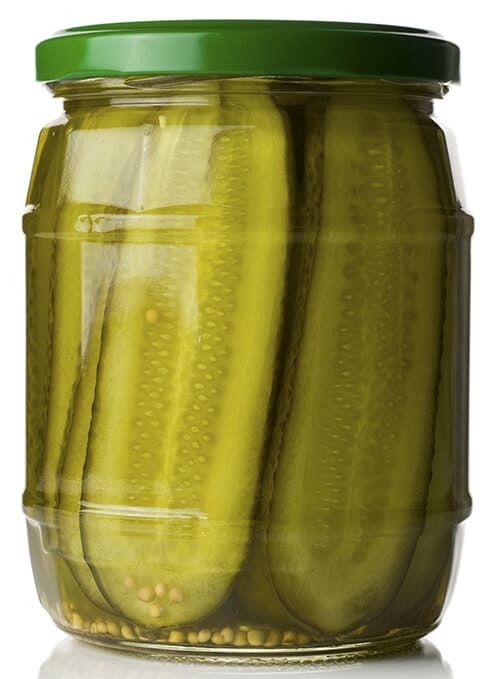 Have you noticed that liquid substance that has accumulated on your plate and at the end of the pickle jar? With nothing but vinegar, water, salt, and oil, this nasty liquid can make your dog very ill. While pickles that are mildly spiced can still be considered for your eager dog, pickle juice is strictly prohibited. Simply stated, it is poison for your dog and will just add to more health concerns for your pet. Okay, So far we’ve covered the bad stuff: Sodium, Onions, Garlic and worse… Pickle Juice. If you really must feed your dog pickles, sweet pickles are a better option of the lot. Although, here also you will have to maintain the limit of servings for your dog. As these sweet pickles are less concentrated, they still contain sugar. Just like sugar is bad for your own health, it can cause diabetes, weight gain, and cavities in your dog. As we love our dogs, we definitely don’t want that. So just keep in mind about your loyal friend and avoid the temptation to feed him what you are eating at all times. May I know the alternative of pickles for my dog? Given these points above, you might not want to give your dog even that occasional pickle and that’s alright. As you know, cucumber has many benefits. Try feeding your dog raw cucumber instead of the pickle itself. He may surprise you by how much he likes it. Another thing you can try is giving them vegetables like carrots, peas, cauliflower and broccoli florets, and more. These alternatives will keep your pooch satisfied and as a dog owner, you’ll have a peace of mind. This is what I like to call a win-win situation for both me and my canine buddy. Should I be worried if my dog has already eaten a pickle? It can be a sickening situation when your dog eats something he isn’t supposed to. But before you panic and take your dog to the vet, just do one thing. Check the pickle jar for the list of ingredients. If it contains ingredients like onion or garlic and your pet starts to get uncomfortable, get him checked from a vet for thorough diagnosis. Otherwise, if this is just a rare accidental gulp, your pooch is most probably fine and in good health. But be careful for the next time. A piece or two of pickle won’t harm your dog. But try to keep him on a good and balanced diet with cucumbers and other veggies. However, steer clear of toxic pickle juice for your dog. Do you have a dog who loves pickle or has your dog ever eaten a pickle? How did he react to it? We would love to hear what you did and what all pickle substitutes do you include in your pet’s diet? Let us know in the comments below. Can Dog Eat Bell Peppers? Can Dogs Eat Tuna and Other Nutrition?